The iconic figure of Princess Diana Spencer shocked the entire world with her death in 1997. Jillann Gabrielle has her speaking from her grave as a spirit haunting the halls of Kensington Palace. And there is a twist…she has aged. She cut a deal with St. Peter at heaven’s gate. She would be allowed to stay with her sons at the palace…but in return she would age. Diana had a great sense of humor, played the piano, sang, and danced. 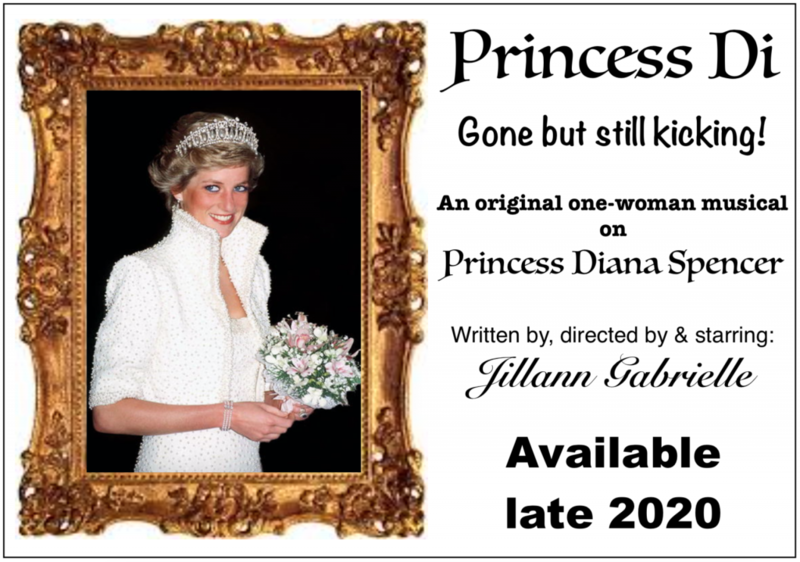 All of these skills are utilized as Diana spins the story of her personal and public life and the British Royal Monarchy…then AND now! Princess Di: Gone but still kicking! will be available in late 2020. But Jill will be concertizing much of the score as she plays and sings from the piano, as Diana, in venues across Chicagoland between now and then. Check the calendar for upcoming dates of all her shows. And check back to this website for more info, tracks, photos, videos, dates, etc.